Florida Atlantic University’s Greg Joseph and “Buddy” Gregory Howell, Jr. have signed free agent contracts with the Miami Dolphins. Both Joseph and Howell were four-year products of the Owls and instrumental in leading FAU to an 11-3 record in 2017, while bringing home the program's first Conference USA Championship and a CherriBundi Tart Cherry Boca Raton Bowl Championship. Joseph provided nearly every kickoff the last two seasons, a total of 277 in his career, He was 57-of-82 in field goals with his longest being a 54-yarder. 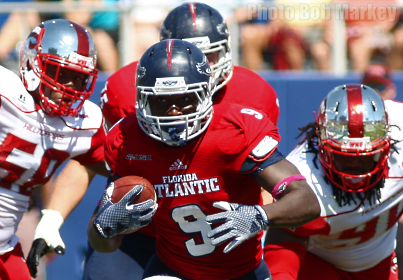 Joseph holds nearly FAU kicking record including being successful in 165 of 170 PAT attempts. Howell (photo) held a career average of 5.2 yards per carry. The Miami, Florida native tallied 2,419 total yards on 462 carries and found the end zone 22 times. He saw action in 39 games and broke for a career long 68-yarder as a freshman. Howell is scheduled to participate in this week's graduation ceremonies, while Joseph graduated a year ago and has nearly completed his master's degree.